Hours: Wednesday through Sunday, noon to 6 p.m.
Best food match, Blanc de Blanc, $30: Crab, scallops or any shellfish. Best food match, Rosé, $22: Salmon. For 20 years, it has been possible to ring in the New Year with sparkling wines made in the shadow of Mount Spokane. Mountain Dome Winery was started in 1984 by Michael and Patricia Manz, and they sold their first wines in 1992. The family, with the help of their two sons and daughter, brought the traditional French method of making sparkling wines to the area and built a reputation for their delicate bubbly. The wines won a loyal following, especially the non-vintage brut with a quirky gnome label, depicting the family members who combined efforts on the wines. The wine operation was shaken in 2006 by the unexpected death of patriarch Michael Manz at age 58, but son Erik Manz continued as head winemaker. They struggled to make the winery profitable without the income of Michael Manz, who had always supported Mountain Dome with income from his day job as the associate medical director and attending psychiatrist for Sacred Heart’s Psychiatric Center for Children and Adolescents. In July 2011, the Manz family sold the winery to Spokane winemaker and businessman Don Townshend, who also owns Townshend Cellar, Lone Canary and Caterina. 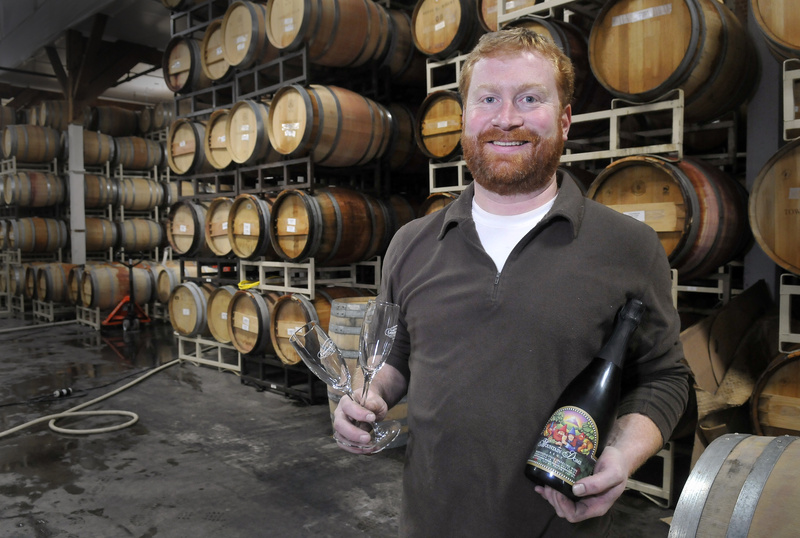 He kept Erik Manz on as the winemaker at Mountain Dome. We recently caught up with Manz to talk about how things have changed since the sale. S-R: Local winemaker and winery owner Don Townshend bought the winery in 2011? Why? Manz: The reason we sold the winery is that we were never able to make it financially solvent. When my father was around he always ended up putting money in. We always felt like we were close, but never quite there. In 2011… my mom wanted to consolidate and move off the property and into town. In order to do that she needed to sell the winery. Don (Townshend) bought the place and I am forever grateful to him for continuing it on. S.R. : How have things changed for you since he bought Mountain Dome? Manz: The production and my job is almost exactly the same as it has been. The only difference is that I sometimes now help with production on Townshend Cellars. S.R. : Are you still using the winemaking facility on Temple Road, where the family winery started? Manz: We’re still making the wines at Mountain Dome. S.R. : Is Don Townshend using that facility for his other wineries? Manz: He had so many barrels that he had about 800 barrels moved out there. At our peak, we had about 200 barrels… and that felt like a lot. Each of those barrels have to be topped every couple of months, so that’s what I have been doing for the past few weeks is just topping off those barrels. S.R. : Are there benefits to being part of a bigger operation now? Manz: I have felt like I was a jack of all trades, master of none. To be able to really focus on the winemaking now has been a really fun project. And to be able to work with Don Townshend’s other winemaker Jerry Widing… (who) along with Brendon Townshend is now the winemaker for Townshend and Lone Canary. Jerry has a lot of expertise in the analytical, enology side of winemaking. It has been a lot of fun working with him on blending. S.R. : Mountain Dome has always prided itself on following the “methode champenoise.” What does that mean? Manz: Everyone calls sparkling wine Champagne, but technically Champagne is a region in France – true Champagne only comes from that region. But what they’re known for is the sparkling wines. The way you make sparkling wine is by first making a regular wine. You can use really any grape, but in Champagne you can only use pinot noir and chardonnay and pinot meunier … it is fermented and aged and then right before bottling, we add yeast and sugar to the wine and it ferments again in the bottle and that is the natural way of producing carbonation … It is really important to let the wines age in the bottle. The fermentation takes about two to three months, so we could theoretically have the product ready in four to five months, but I think it is better with a couple of years worth of age. The non-vintage is aged about two years in the bottle. And my vintage and other wines are aged at least four. The trick of the old method is that it is a very labor-intensive process, so after the wine ferments in the bottle there is a sediment of yeast that settles out and the trick is to try get the yeast out the bottle without losing too much of the carbonation. The riddling racks that they have in France are for turning the bottles and getting the yeast down to the bottom of the neck where we can freeze it and form a plug of ice with all that yeast and then pop the cap or cork off and then the pressure will shoot that plug of yeast out leaving the wine clean and clear. That is how we do it. S.R. : How do others make sparkling wines? Manz: The cheap way of making sparkling wines is by getting a strong tank – it is called the charmat method or bulk method – you charge it with CO2 and then you instantly get a bubbly beverage, much the way you make Coca-Cola or Pepsi. Since it is not produced naturally, the taste is a lot different. The bubbles are a lot bigger and they don’t have as much of the delicate complex flavors. S.R. : How can consumers tell if they’re getting sparkling wines made the traditional way? Manz: Any sparkling wine that is under $10 a bottle is usually made the bulk way. Anything over $10 a bottle is made the traditional way, or methode champenoise… The easiest indicator is the price. S.R. : So, is this a really busy time of year for you? Manz: The holidays are when people think about sparkling wines. I always say that every day is worth celebrating. That is why I love making sparkling wines, I get to encourage people to celebrate life and everyday accomplishments. But naturally people think about it for weddings and anniversaries and New Year’s and then kind of forget about it. The other thing that I love pushing is that it is a great food wine. People don’t always think about serving sparkling wines with a meal, but they are so wonderful with such a variety of different foods. S.R. : Did you study from the very beginning to become a winemaker? Manz: Not really formally. I got a degree in biology in 1998. I graduated from Pacific Lutheran University and then lived for a year in Champagne. I went there for the harvest in 1999 and worked at a couple of different wineries there. I took a few classes at the university… I went over there thinking I was going to learn a lot and I would be able to come back and teach my parents a bunch, and I quickly learned that really I kind of already knew what I needed to do to be a good winemaker. It was good affirmation. Tradition is so much more a part of what they do over there… I always wanted to work for my family in winemaking. My parents started making wine when I was 8 and for my 16th birthday my dad gave me a ton of chardonnay and I made a still wine out of that and really kind of got the bug from that point. S.R. : When did you start officially working at the winery with your father? Manz: I started full time at the winery in 2000. The plan was for me to start out as assistant winemaker and then eventually become winemaker. Shortly before he died, I became officially the winemaker. S.R: Do you still hear his guidance when you are making wines? Manz: Oh, very much so. My father always liked to do things the most challenging way, the hardest way. I felt like if we could simplify things and make things easier, that’s better… I have fond memories of blending wine with him. I always think blending is where a winemaker can put his or her signature on the wine and crafts the wine in their style and I can hear him kind of speaking to me about blending… He always blended toward more pinot noir and less chardonnay because that is the taste profile that he liked, but as my tastes of changed I’ve started to put just a bit more chardonnay into our blend. S.R. : Is there anything new happening at Mountain Dome? Manz: We have a new blanc de blanc, which is a newer wine for Mountain Dome. It is the first release of an all chardonnay sparkling wine. … It’s a non-vintage, but it is based off of the 2006 harvest which is the last harvest that my dad was a part of. We started it just before he passed away. We always wanted to produce a blanc de blanc, but an all-chardonnay sparkling wine is pretty difficult to make because you have to have just the right grapes and the right growing conditions. It’s a lot different from our other blends because of the lack of pinot noir. To me, all of the wines that I have done throughout my life have had that green apple, kind of a Granny Smith, malic taste. Whereas to me, the blanc de blanc has a lot more citrus, lemony flavor.